It’s hard to imagine that Tim Harford ever writes a duff word. His new book, Messy, is a pleasure to read. (It’s published in a couple of weeks but The Economist jumped the gun with a review so I’m going to go ahead with mine now.) Messy is closer in spirit to Tim’s Adapt rather than his Undercover Economist or Undercover Economist Strikes Back. 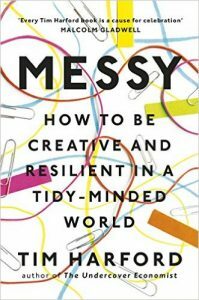 It gathers research and stories from several different fields to weave them into the theme of the title, and make the case for appreciating mess and avoiding tidy-mindedness. 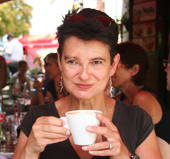 There are many other accounts of mavericks and independent-minded innovators. The book gives examples from military campaigns, creative contexts (such as Bowie’s reinvention of his music in Berlin), business and nature. I particularly liked the example of the way 18th century scientific foresters in Germany tried to measure the forests using the metric of a Normalbaum, or standardised tree. The idea was to make sense of the messiness of the forest by assigning standard sizes to trees so it would be possible to count how many trees of what dimensions there were, and thus assess the total volume of wood. What happened? “The mess of old forests began to be tidied up. The confusing patchwork of threes of various ages and species was replaced with stands of particular species – the Norway spruce was popular – and of a particular age. The foresters lined up the rows to make the forests easier to survey, to police, and in due course to harvest. Dead trees were felled, rotting hulks dragged away, underbrush cleared. The Normalbaum, once a statistically convenient idealisation of a tree, took physical form.” In the short term this was profitable. In the longer term, it destroyed the ecology of the forests. Yields declined, and the Germans by 1968 had a term for it: Waldsterben or forest death syndrome.It’s a terrific, malign example of performativity. This chapter, called Incentives, has a number of very nice examples of the perverse effects of targetting, with echoes of the manic modernism described in James Scott’s Seeing Like A State, and of the phenomenon known to economics as risk compensation. I’m not sure I agree with the prescription make it messy as a sure-fire fix. One example in Messy is the blurring of how urban space is divided between vehicles and pedestrians. The early schemes suggest a messy arrangement is safer: people take greater care because they are uncertain. But we don’t know what will happen over time as everybody gets used to the new arrangements. On the other hand, it’s hard to disagree with the idea that children need to be allowed to play in non-sanitised, non-health-and-safetied spaces if they are to ever learn to cope with risk in life. The common theme in these chapters, which on the face of it seem to gather together a somewhat disaparate set of examples of non-conformism, is the need to design for unpredictability or risk, but also for the fact that people (and trees, and the rest of the natrual world) respond to actions and constraints. It is so hard for decision-makers in any context to realise that they are not social engineers, somehow looking down on the world and able to manipulate it. I entirely agree with this, so recommend Messy. It’s right, it’s a pleasure to read, and it’s out just in time for Christmas.